This is how I mark the sewing line when I do a miter. I typed in a long explanation but hopefully the picture will do, seeing the computer lost it. 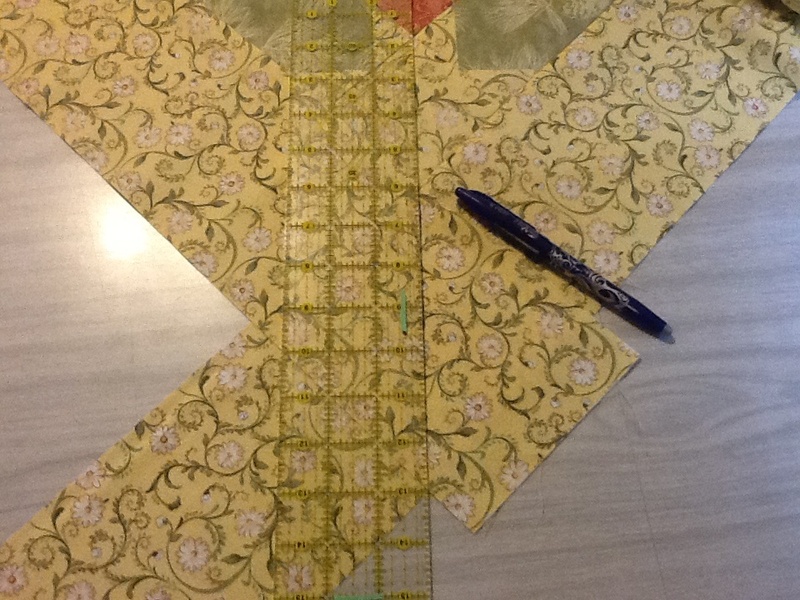 My border is 5-1/4 inches and I left more than 6 inches to do the miter. I will interchange the borders and do the same line with my Frixion pen on the other border. I will then Draw my 1/4 inch cutting line beyond the sewing lines and trim and sew. I always just fold and press and pin really, really well. Then the pressed line is my stitching line. Awesome, thank you Tartan!!! I just finished puting two mitered borders on my lastest quilt, messed up on one corner and had to rip out and put on new side. Real pain!!! Got it right the second time but not with out checking and checking again before I cut. Your way looks so much better, again thank you!!!!!!!! After I had to replace the side one time, I quit trimming before I sewed the miter. I too use the fold and press method, but I glue the creases together.